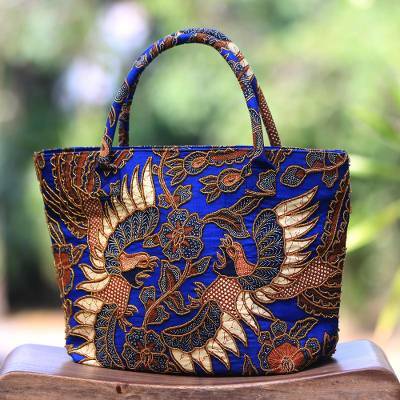 Beaded Blue Cotton Batik Handbag Hand Crafted in Bali, "Glorious Java"
Two colorful birds wing across this beautiful blue handbag from Wahyu Sulistiani. Created in batik on cotton, the sawunggaling motif depicts the king's favorite rooster, which is a symbol of Javanese beauty and power. Lavish beadwork is applied by hand, and the roomy tote — lined in black — opens to reveal a convenient inner pocket. Wahyu Sulistiani has received 7 microcredit loans with 0% interest from Kiva and Novica, the first for $200 and the most recent for $1250. Proceeds were used to stock up on fabric and other materials to increase production. This handbag is beautiful and I always get compliments when I use it. Lots of beading detail and the blue is a beautiful color. I purchased this handbag to go with a navy velvet outfit and also with a navy cashmere and silk outfit. Both outfits are dressy, but not what I would call "formal." The bag works perfectly not only with both blue outfits, but there is also enough brown in the purse to go with a chocolate silk outfit, too. The hand beading is so beautiful. The blue cotton is a very thick material so it is a very substantial piece. The bag is larger than I had anticipated, but that is a good thing for me, as I carry a lot of items in my purse, and they all fit in this bag. Thank you so much, Wahyu, you are an incredible artist. "A must for your wardrobe !" 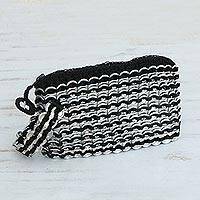 very beautiful and useful handbag. "Beautiful does not quite say it"
The precision work and attention to detail in this purse are mazing. I am so glad to own it. "Goes beautifully with my beautiful wife"
Truly a work of art that is also very functional. The vibrant colors leap off the bag and the designs are captivating. This is an absolutely stunning bag. The colors are vibrant and rich looking. Kudos to Wayhu the artist. This bag is lovely! The fabric is beautiful and the beadwork is stunning. So intricate! I am replacing my old tote bag with this. Love the magnetic closure-very convenient. I found the overall color to be more brown than burgundy, but I still love it and can't wait to take my new bag to town. Words cannot describe the exquisite workmanship that goes into these purses. I get distracted by the detail and skill every time I look at it, my most recent purchase is the red bag with the roosters...it also comes in blue (I'll order that next). Pictures do not do her work justice.